Everyone with a keyboard and an opinion has been dissing the new Ducati Scrambler before the first pic landed. Yes, the endless teasers were loathsome, the hipster-driven social media campaign was inane, and I still don't know what the hell this thing was about. But the haters are brand-fellating elitists without a damn clue. As a reminder, Ducati is in this business to make money. 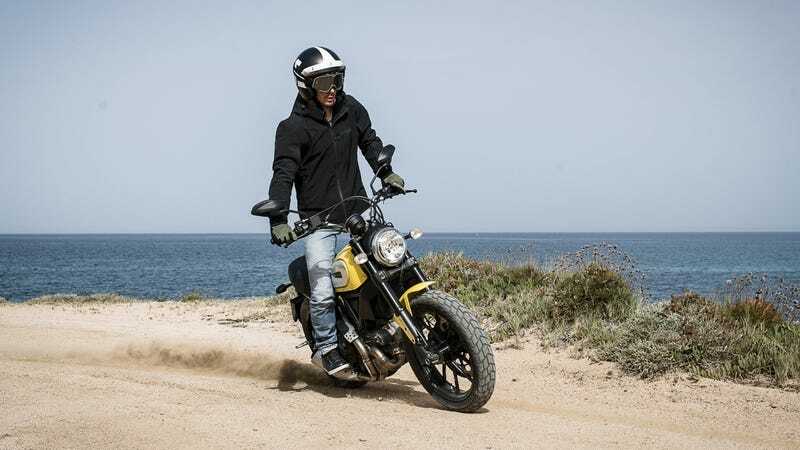 By resurrecting the Scrambler, they've made a new entry-level bike that'll get more riders on the road and cash in their pockets. It's a win-win. And any talk of brand dilution or lost heritage or cheapening the holy marque went right out the door when the first Panigale t-shirt was sold. The world needs new riders and the Scrambler is way to get butts on seats. Dispatch with the marketing speak and "post heritage" design bloviating and what you have with the Scrambler is a solid, handsome, inexpensive bike for both new riders and those looking for an Italian-flavored toy. It uses the same fuel-injected, air-cooled 803cc L-twin as ye' old Monster 796, putting out 75 hp and 50 pound feet of torque. A six-speed drives the 17-inch rear wheel, sprung by a single spring/shock combo and an aluminum swing arm. Kayaba suspension bits are up front and knobby(ish) Pirelli MT60RS tires are at each end. Braking is handled by ABS-actuated Brembos, with a 330mm single disc up front and four-piston caliper, which is fine considering the Scrambler only weighs around 375 pounds dry. As with anything aiming to please the custom crowd, the Scrambler has been designed to make swapping components easy, including electrical connectors that separate each part of the loom. And aside from the exposed trellis frame and round LCD gauge, our favorite part is the LED-rimmed headlight that apes BMW's "angel eyes". Ducati is offering four versions of the Scrambler when it goes on sale early next year. The base Icon red model comes in at $8,495 with the yellow paint commanding and extra Benjamin. The Full Throttle ($9,995) is more of a flat-tracker style, with Termignoni exhaust and a bumblebee paint theme. The Urban Enduro ($9,995) packs a front mudguard, headlight grill, cross-brace on the handlebar, sump guard, and green paint with a brown seat. And the Classic (again, $9,995) gets spoked wheels, a number plate mount, metal mudguards, and a different tank design. For that kind of scratch – and that customization potential – the Scrambler is going to be a mean deal to beat. And if it brings more riders into the fold, the only people who lose are overweight 1199 riders that use chain lube to stuff their guts into their Ducati-branded leathers.